What is a read mapping? In the 1930s the pseudonym Nicolas Bourbaki was adopted by a group of French mathematicians who sought to axiomatize and formalize mathematics in a rigorous manner. Their project greatly influenced mathematics in the 20th century and contributed to its present “definition -> theorem -> proof” format (Bourbaki went a bit overboard with abstraction and generality and eventually the movement petered out). In biology definitions seem to be hardly worth the trouble. For example, the botanist Willhelm Johannsen coined the term “gene” in 1909 but there is still no universal agreement on a “definition”. How could there be? Words associated with biological processes or phenomena that are being understood in a piecemeal fashion naturally change their meaning over time (the philosopher Joseph Woodger did try to axiomatize biology in his 1938 book “The Axiomatic Method in Biology” but his attempt, with 53 axioms, was ill fated). Bioinformatics occupies a sort of murky middle-ground as far as definitions go. On the one hand, mathematics underlies many of the algorithms and statistical models that are used so there is a natural tendency to formalize concepts, but just when things seem neat and tidy and the lecture begins with “Let the biological sequence S be a string on an alphabet of size 4 or 20″, biology comes along and rips the blanket off the bed (there are 22 proteinogenic amino acids, molecules may be single or double stranded, they could be circular, bases may be chemically modified, and so on and so forth…). In some cases things have really gotten out of hand. The words “alignment” and “mapping” appear, superficially, to refer to precise objects and procedures, but they probably have more meanings than the verb “run” (which is in the hundreds). To just list the meanings would be a monumental (impossible?) task. I will never attempt it. However I recently came across some twitter requests for clarification of read alignment and mapping, and I thought explaining those terms was perhaps a more tractable problem. Figure 1 from the Consed paper. To obtain multiple alignments phrap required a “model”. Roughly speaking, a model is an objective scoring function along with parameters, and, although not discussed in the Consed paper, that model was crucial to the functionality and performance of phrap. The phrap model included not just mismatches of bases but also insertions and deletions. Although phrap was designed to work with Sanger reads, there is conceptually not much difference between the way “read alignment” was used in the Consed paper and the way it is sometimes used now with “next-generation” reads. In fact, the paper “Correcting errors in short reads by multiple alignments” by L. Salmela and J. Schröder, 2011 does much of the same thing (it would have been nice if they cited phrap, although in their defense phrap was never published; Consed was about the visualization tool). An underlying notion of what a read alignment is. Without being overly formal I think its useful to consider the form of the phrap input/output . This is my own take on it. First, there was a set of reads with each read consisting of a sequence so that is an ordered set (for simplicity I make the assumption that the reads were single end, each read was of the same length l, and each sequence element , and of course I’ve ignored the reverse strand; these assumptions and restrictions can and should be relaxed but I work with them here for simplicity). Next, there was a set of target sequences (contigs, to be precise) that I denote by with . These each consisted of a sequence, again an ordered set, . A “read alignment” in phrap consisted of a pair of maps: first specifying for each read the contig it maps to (or the mapping to denoting an unaligned read), and also a set of additional maps assigning to each base in each read a corresponding base (or gap in the case of ) in the contig the read mapped to. A model: Given the notion of read alignment, a model was needed to be able to choose between different alignments. In phrap, the multiple alignments depended on scores for mismatches and gaps (the defaults were a score of 11 for a match, -2 for a mismatch, -4 for initiating a gap, -3 for extending a gap). In general, a model provides an approach to distinguishing and choosing between the read alignments as (roughly) defined above. An algorithm for read alignment. Given a model there was a need for an algorithm to actually find high scoring alignments. In phrap the algorithm consisted of performing a banded Smith-Waterman alignment using the model (roughly) specified above. The Smith-Waterman algorithm produced alignments that were global, i.e. order preserving between the elements of and . Data structures for enabling efficient alignment. With large numbers of targets and many reads, there was a need for phrap to efficiently prune the search for read alignments. Running the banded Smith-Waterman alignment algorithm on all possible places a read could align to would have been intractable. To address this problem, phrap made use of a hash to quickly find exact matches from parts of the read to targets, and then ran the Smith-Waterman banded alignment only on the resulting credible locations. Statistically, this could be viewed as a filter for very low probability alignments. The four parts of phrap are present in most read alignment programs today. But the details can be very different. More on this in a moment. 2004: Six years after Consed paper the term “read alignment” shows up again in the paper “Comparative genome assembly” by Pop et al. In the paper the term “read alignment” was not defined but rather described via a process. Reads from obtained via shotgun sequencing of the genome of one organism were “aligned” to a reference genome from another closely related organism using a program called MUMmer (the goal being to use proximity of alignments to assist in assembly). In other words, the “alignments” were the output of MUMmer, followed by a post-processing with a series of heuristics to deal with ambiguous alignments. It is instructive to compare the alignments to those of phrap in terms of the four parts discussed above. First, in the formulation of Pop et al. the alignments were between a single read and a genome, not multiple alignments of sets of reads to numerous contigs. In the language above the map was much simpler in Pop et al., with the range consisting only of chromosomes in a genome rather than the thousands of contigs in an assembly. Second, although MUMmer utilized an implicit model for alignment, the model was of a very different meaning. Reads from one organism were being aligned to sequences from another, a task fundamentally different than aligning reads back to sequences they originated from (albeit with error). In other words, “alignment” in the Pop et al. paper referred to identification of homology. This opens up a whole other bag of worms that I wrote about in a paper with Colin Dewey in 2006 and that I will not open here. In terms of data structures, MUMmer made use of a suffix tree rather than a hash, a distinction that is important in that suffix trees provide a much richer possibility for search (MUM stands for maximum unique match, the kind of thing suffix trees are useful for finding and that MUMmer took advantage of). A lot of the research in read alignment has centered on developing efficient and compact data structures for string search. Another development in the year 2004 was the appearance of the term “read mapping”. In the paper “Pash: efficient genome-scale anchoring by positional hashing” by Kalafus et al., hashing of k-mers was used to “anchor” reads. The word “anchoring” was and still is somewhat ambiguous as to its meaning, but in the Pash context it referred to the identification of positions of exact matching k-mers within a read on a target sequence. In other words, Pash could be considered to provide only partial alignments, because some bases within the read would not be aligned at all. Formally, one would say that the functions had as their domain not the full reads but rather strict subsets where is nonempty. For this reason, in the Pash paper the authors suggest post-processing their output with base-pair level sequence alignment programs popular at the time (e.g. AVID, LAGAN) to fully “align” the reads (they could have also suggested performing a banded Smith-Waterman alignment like phrap). 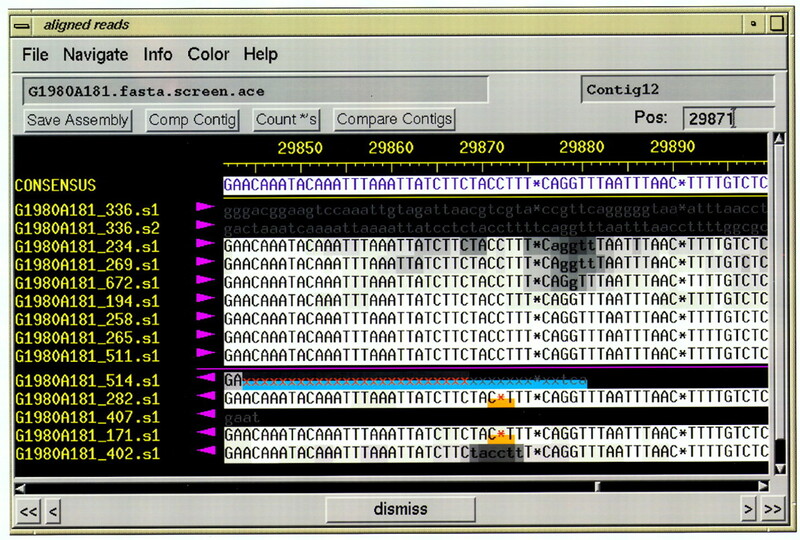 2006: The first sequencer manufactured by Solexa, the Genome Analyzer was launched, and following it the ELAND program for “read alignment” was provided to customers buying the machine. This was, in my opinion, a landmark even in “read alignment” because with next-generation sequencing and ELAND read alignment became mainstream, a task to be performed in the hands of individual users, rather than just a step among many in complex genome sequencing pipelines manufactured in large genome sequencing centers. In the initial release of ELAND, the program performed “ungapped read alignment”, which in the language of this post means that the maps had the property that if then , i.e. there were no gaps in the read alignments. 2009: With two programs published back-to-back in the same year, BWA (“Fast and accurate alignment with the Burrows-Wheeler transform“, Heng Li and Richard Durbin) and Bowtie (“Ultrafast and memory-efficient alignment of short DNA sequences to the human genome” by Ben Langmead, Cole Trapnell, Mihai Pop and Steven L Salzberg) read alignment took a big step forward with the use of more sophisticated data structures for rapid string matching. BWA and Bowtie were based on the Burrows-Wheeler transform, and specifically innovations with the way it was used, to speed up read alignment. In the case of Bowtie, the alignments were ungapped just as originally with ELAND, although Bowtie2 published in 2012 incorporated gaps into the model. Also of note is that by this time the terms “read alignment” and “read mapping” had become interchangeable. The BWA and Bowtie papers both used both terms, as did many other papers. Moreover, the terms started to take on a specific meaning in terms of the notion of “alignment”. They were referring to alignment of reads to a target genome, and moreover alignment of individual bases to specific positions in the target genome (i.e. the maps ). This was in large part due to the publication of the sequence alignment format also in 2009 in Heng Li et al.‘s important paper on SAMtools. Finally, 2009 was the year the notion that “spliced read alignment” was introduced. “Spliced alignment” was a concept around since the mid 90s (see, e.g. “Gene recognition by spliced alignment” by MS Gelfand, AA Mironov and PA Pevzner). The idea was to align cDNAs to a genome, requiring alignments allowing for long gaps (for the introns). In the paper “Optimal spliced alignments of short sequencing reads” by Fabio De Bona et al. the authors introduced the tool QPalma for this purpose, building on a spliced alignment tool from the group called Palma. Here the idea was to extend “spliced alignment” to reads, and while QPalma was never widely adopted, other programs such as TopHat, GSNAP, Star, etc. have becomes staples of RNA-Seq. Going back to the formalism I provided with the description of phrap, what spliced alignment did was to extend the models used for read alignment to allow for long gaps. In the following years, there was what I think is fair to characterize as an explosion in the number of read alignment papers and tools. Models were tweaked and new indexing methods introduced, but the fundamental notion of “read alignment” (by now routinely also called “read mapping”) remained the same. 2014: In his Ph.D. thesis published in December of last year, my former student Nicolas Bray had the idea of entirely dropping the requirement for a read alignment to include the maps . In his setup, a read alignment would consist only of specifying for each read which target sequence it originated from, but not where in the target sequence it aligned to. The point, elaborated on in Chapter 2 of Nick’s thesis, was motivated by the observation that for many applications (e.g. RNA-Seq) the sufficient statistics for the relevant models are essentially the information contained in the map alone. He called this notion of read alignment “pseudoalignment”, as it is a fundamentally different concept than what was previously thought of as read alignment. Pseudoalignment offered a reprieve from what was becoming an unbearable task, and (I believe) it is going to turn out to be a useful and widely applicable concept. 2015: Earlier this year we posted a preprint to the arXiv detailing a method for performing pseudoalignment based on the ideas in Nick’s thesis, with the additional idea of Páll Melsted to use a new type of indexing scheme based on a de Bruijn graph of the target sequences. The program implementing these ideas is called kallisto. Looking back at phrap, kallisto can be seen to consist of a different notion of read alignment (pseudoalignment), a novel data structure (the target sequence de Bruijn graph), and a new fast algorithm for finding pseudoalignments (based on intersecting sets of k-mer matches). Although we did not discuss the model explicitly in our paper, it is implicit via the algorithm used to find pseudoalignments. One useful thing to keep in mind is that the nature of the index of kallisto allows for extracting more than a pseudoalignment. If desired, one can obtain positions within the targets for some k-mers contained in a query read, or even strand information, and in fact such data is used in some parts of kallisto. When such information is extracted, what kallisto is performing is no longer a pure pseudoalignment, but rather what the Pash authors called a read mapping (although that term is unsuitable because as mentioned it has become synonyms with read alignment). It turns out there is now another word for exactly that concept. Following the publication of kallisto on the arXiv another preprint was posted on the bioRxiv introducing a program called Salmon and a new term called “lightweight alignment” (Salmon: Accurate, Versatile and Ultrafast Quantification from RNA-Seq Data Using Lightweight-Alignment by Rob Patro, Geet Duggal and Carl Kingsford) . Lightweight alignment as a notion of alignment is exactly what was just referred to: the notion of read mapping in Pash. Utilizing an index and software by Heng Li called the FMD index, Salmon determines “lightweight alignment” chains of what are called maximal exact matches and super-maximal exact matches (not to be confused with the maximal unique matches, or MUMs discuss above). These provide partial alignment information for the sequences in each read, i.e. just like with Pash one obtains maps but with the domain sometimes restricted to a nonempty subset when the MEMs or SMEMs don’t cover the read. Again, I find it useful to refer back and compare to phrap: with Salmon the “read alignment” consists of a different type of index and an algorithm associated with it (making sure the MEMs/SMEMs are consistent). The notion of alignment is distinct from that of phrap by virtue of the restriction of the domain in the maps . I think a new term for the latter concept since the one Pash used failed to stick, and “lightweight alignment” seems fine. Recently (just last week) a new read alignment related term was introduced in a bioRxiv preprint. A paper describing a new program called RapMap uses the term quasi-mapping for the procedure implemented in the software. RapMap finds pseudoalignments in the sense described above, with the only difference being the type of index that is used (instead of the target de Bruijn graph, it utilizes a generalized suffix array together with a hash table related to the array). This time I think the introduction of new terminology was unfortunate. Just as with kallisto, RapMap can be used to extract more information than just a pseudoalignment from the index (i.e. a lightweight alignment), and indeed the program does so. But also like kallisto, the speed of RapMap is derived from the idea of efficiently finding pseudoalignments by intersecting sets of k-mer matches. In other words, quasi-mapping is a procedure and not a concept; what the procedure outputs is a lightweight alignment via a pseudoalignment. Read alignment is what you think it means. A read mapping is a read alignment. Lightweight alignment is “partial” read alignment (it should have been called read mapping but that was taken). Some, but not necessarily all bases in a read are aligned to specific bases among target sequences. Pseudoalignment is read assignment to target sequences without any base-level sequence alignment. Read alignment, lightweight alignment and pseudoalignment are concepts, not algorithms. Quasi-mapping is a procedure and not a concept. The procedure outputs a lightweight alignment via a pseudoalignment. Disclaimer: I’ve almost certainly gotten some dates wrong, missed some papers I should have cited, and omitted some crucial developments in read alignment that I should have included. Please let me know if you think that is the case by commenting and I’ll update the post as needed.